San Francisco employees in a wide variety of industries – nightlife and entertainment, hotels, food and beverage production and distribution, janitorial and security services, and many others – must travel to and from work during late-night and early-morning hours. Access to and awareness of safe, reliable overnight transportation is critical to the continued success of these workers and their industries, as well as to the City residents and visitors who patronize many of these businesses. 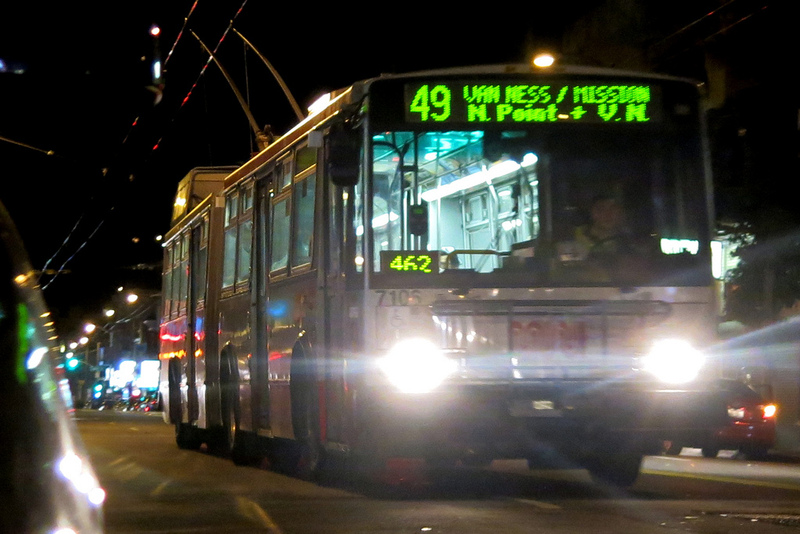 In February 2015, the San Francisco Late Night Transportation Working Group released a report of findings and recommendations called The Other 9-to-5: Improving Late-Night and Early-Morning Transportation for San Francisco Workers, Residents, and Visitors. Pursuant to the Working Group’s report, the San Francisco Office of Economic and Workforce Development has issued a request for proposals for organizations to improve late-night and early-morning travel for San Francisco workers, residents, and visitors by 1) auditing the existing state of overnight travelers’ comfort, safety, security, and/or awareness of transportation options within a San Francisco neighborhood, commercial corridor, or other defined area within the City; and 2) designing and implementing location-specific projects that are responsive to the needs identified during the audit. To learn more about this opportunity, please visit OEWD’s web site. Proposals are due on December 9, 2015, at 5pm PST. BART service between the Embarcadero and West Oakland stations will be closed for two upcoming weekends, August 1-2, and September 5-7, for repairs to improve track safety. A lifeline bus bridge will be in place for riders with no other options, but BART is encouraging travelers to find alternative means of transportation. During the shutdowns, customers are encouraged to use other public transit transbay options such as ferries and AC Transit service. Check out www.511.org for trip planning. San Francisco Bay Ferry will have additional service on its Alameda/Oakland/San Francisco and Vallejo/San Francisco routes during the BART closures. AC Transit also has its transbay service. During the shutdowns, train service within the East Bay and within the West Bay and the Peninsula will be more frequent than during a typical weekend. Check out our tips page for more specific details. View a map of the bus bridge below. BART has also published a page of tips for travel during the transbay shutdown weekends. Click on the map to view a larger version of this image. Evening travelers take note: beginning on July 31, 2015, SFMTA will be working on several projects to upgrade the City’s Muni subway system that will require early subway shutdowns, seven nights a week, with bus shuttles replacing subway service until the projects are completed in January 2016. While the subway is closed to rail service, replacement bus service will be provided between Embarcadero and St. Francis Circle for the K/T, L and M lines. A bus bridge will also be in place for the N Line between Church & Duboce and Caltrain Depot at 4th and King street and for the T Line between Mission Rock and Embarcadero. Regular rail service will continue to operate at outer stops. See map for bus routes and stops. In order to ensure that the tunnel is clear of trains at 10 p.m., depending on where you catch the train, service might end as early as 9:30 p.m. (example: Embarcadero may clear as early as 9:30 p.m., whereas Castro last train may be at 9:45 p.m.). Bus shuttle service will be operational by 9:30 p.m. each night. Muni Metro customers can board bus shuttles at the island F streetcar line stops adjacent to subway stations on Market Street (look for the yellow half-moon sign). The inbound J Church will end at Church and Market. Customers can transfer to bus shuttle at F streetcar stops on Market Street. The inbound N Judah will switch back at Church & Duboce. Customers getting off the train can walk one block to Market Street to board shuttle bus to downtown. Bus shuttle frequency: approximately every 8 minutes. For more information about this project, read this fact sheet about the project. The latest updates and additional materials can be found at sfmta.com/subwayupgrades. Over the past year, the San Francisco Office of Economic and Workforce Development (OEWD) and the San Francisco Entertainment Commission have been leading a Late Night Transportation Working Group comprised of local transportation providers, representatives from late-night and early-morning businesses, labor unions with employees who work these shifts, nightlife advocates and other stakeholders interested in overnight transportation issues. Earlier this year, the Working Group published its findings and recommendations, identifying five key next steps to prioritize moving forward. In order to help implement these important changes, OEWD is partnering with the SFMTA and Fuse Corps — a Bay Area nonprofit that places entrepreneurial professionals from the private and social sectors in leadership roles on high-impact strategic projects — to host a Mayor’s Executive Fellow focused on “Improving Overnight Transportation for Workers.” Starting in October 2015, the Fellow will work for one year with various City departments, regional government partners and local industries to help ensure that overnight transportation options better match the evolving needs of businesses, workers, residents, and visitors within San Francisco. Candidates are expected to have at least ten years of professional experience in a relevant field, particularly with a background in program management, transportation, workforce development, economic development, regional planning and/or coalition-building initiatives. The ideal candidate should also be passionate about the underlying issues of equity attached to increasing transportation options for San Francisco’s workforce. Learn more about this fellowship and apply for the position at Fuse Corps’ web site.